November finally brought some Jubilee items of interest after a drought after 2 or 3 months of very little. First off is this mint 9d Jubilee. At first glance, nothing special. Take a closer look and you’ll see that it is a forgery! I slightly regret not going for it. It could well be a modern replica in which case it’s worthless, but something about it tells me it’s not. 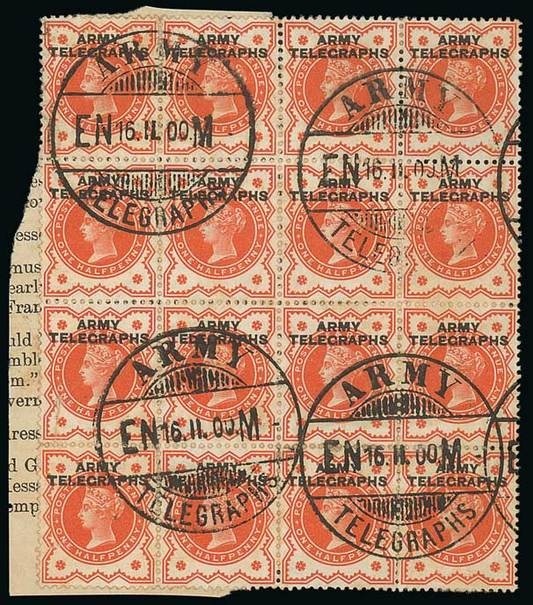 The fact that the perforations are a pretty good attempt at simulating the genuine stamp, given away by the fact that it looks like it is line perforated and not comb perforated (the corner perfs are misshapen when they should be more symmetrical). The definition of the printing isn’t great, but it doesn’t look like it’s been done a laser jet printer. I’ve not heard of any contemporary forgeries of the Jubilees, but at £4.85 it may well have been a worthwhile gamble. 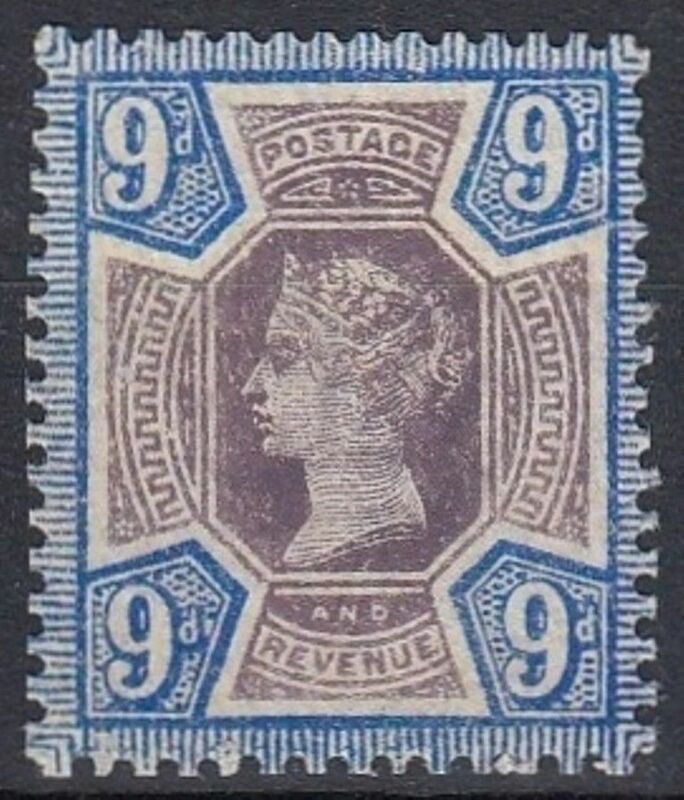 Although philatelic, this 1890 Penny Postage Jubilee uprated with a 10 Jubilee and tied by the special cds is very attractive and sold to the only bidder at £99.99 plus postage. 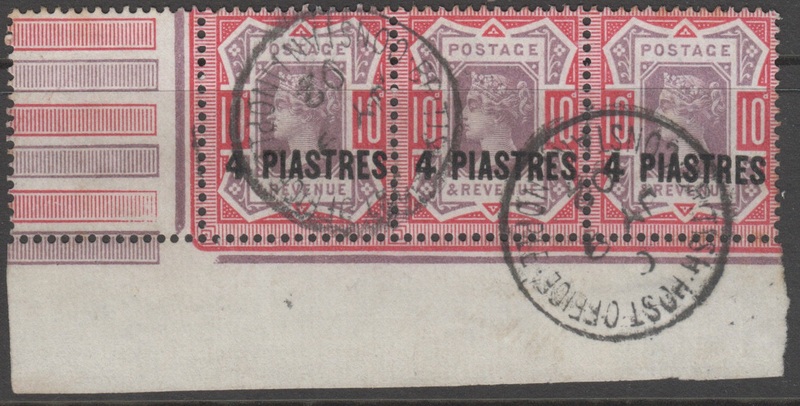 This mixed issue franking with a 2 1/2d “Lilac & Green” and a 2d Jubilee surprised me by selling for as much as £77.93 in spite of the toning around the stamps. 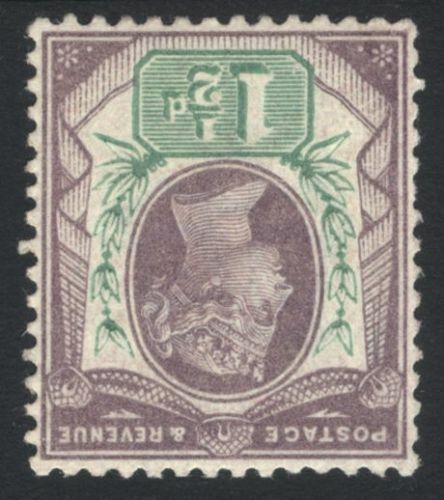 I’ve noticed that Jubilee usages in early 1887 are pretty uncommon and I see quite a few “Lilac & Green” usages still in this period on eBay, so it is very unusual to see both on the same cover. And I’ll finish this month with a couple of my purchases. At the minute I’m into single frankings and multiple frankings of the same stamp. So when these two giant registered envelopes came up I couldn’t help myself. It’s exactly the type of thing you hear people saying you shouldn’t buy because you can’t display them in an exhibition. 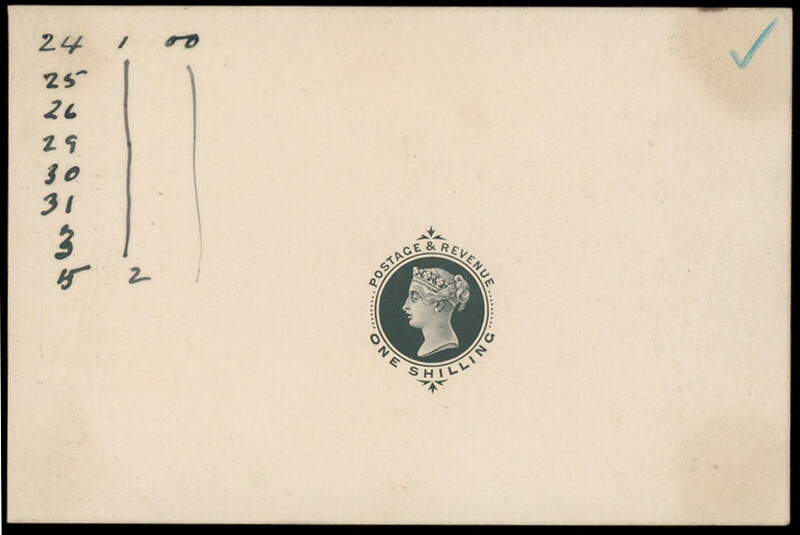 But this 1887 cover with the 3d is paying the inland rate up to 8oz, and the 1894 cover with the 1/2d vermilions is paying up to 6oz. I think they are very scarce and it’s amazing really that these big covers weren’t thrown out at the time. So I was pleased to pay £10.94 and £21.95 respectively. After another quiet summer on the Jubilee front on Ebay with not much of interest to talk about, I decided to go for a theme this month; beautiful circular datestamp (cds) strikes. Or as the Americans say, “socked on the nose” cancels. 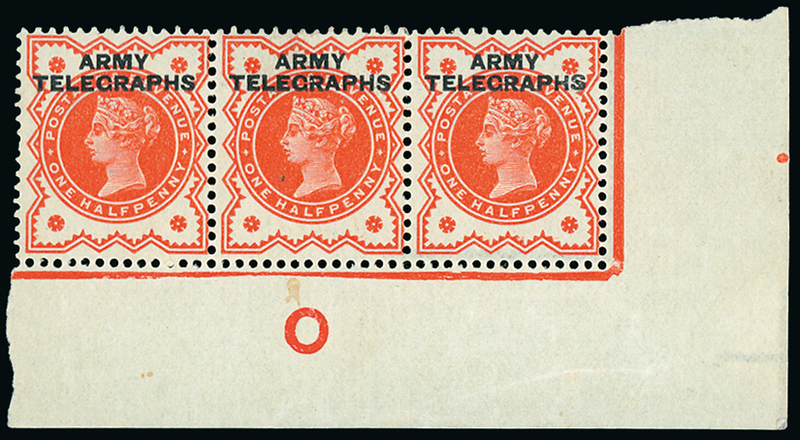 Starting with the cheapest and most abundant stamp of the set, the ½d vermilion had over 13 billion printed. So it can be a little tricky to find an example as attractive as the one shown, as it takes a lot of trawling through the many, many that still exist. 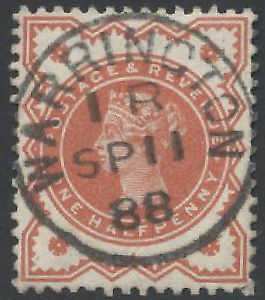 So the winning bidder of this stamp paid £17 instead of doing the hard graft. That’s over 14 times the catalogue price of £1.20 in Stanley Gibbons. The 4d green and brown is hard to find nicely used because of the fugitive ink in the green is easily affected by moisture (in fact it’s the one I’m in most need of upgrading in my collection). So any that have been soaked off will have lost some of the green to a degree. You almost have to be looking for a stamp still on piece. These two appear to have been removed carefully enough to be unaffected, and sold for £12.30 (above) and £9.81 (below) against a catalogue value of £18. The 5d dull purple and blue doesn’t often come with a cds. 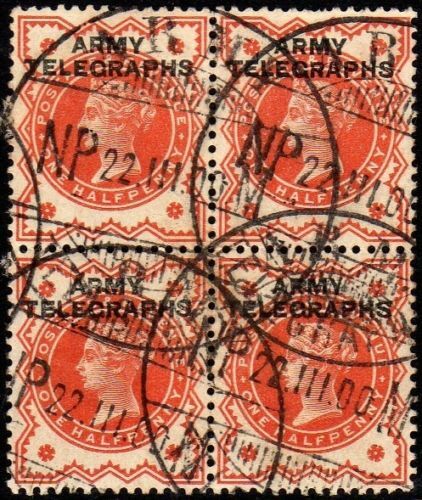 I think for the most part because it was used predominantly to pay the double UPU letter rate, and often duplex cancels (with the barred oval obliterating the stamp) or squared circles (collectable in their own right but undeniably less attractive) were employed. 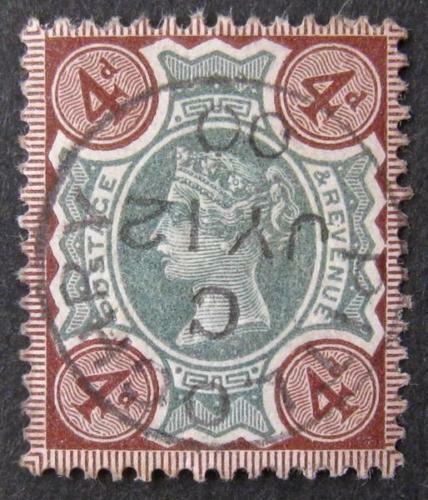 Even with a toned perf, this example sold for £15.29. Full catalogue! 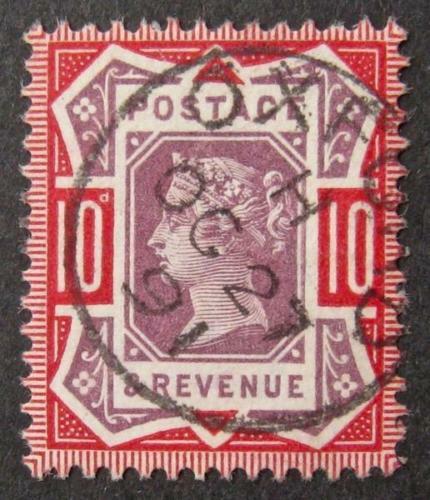 And finally the 10d, which is the highest catalogued stamp (at £45 for the standard carmine shade) in this report but paradoxically, I think, one of the easiest to find with a nice cds. So I was surprised to see this one sell for a much as £26.80 as you can get equally nice examples for around £10-15. 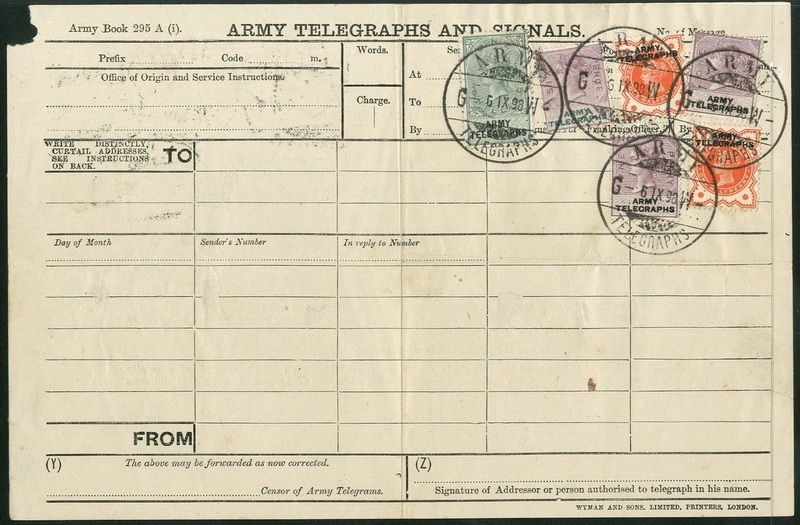 I believe the reason that the 10d (as well as the 6d, 9d and the 1s green & carmine) is easier to find socked on the nose is because it was used more often for things such as parcel labels, telegrams and the like, which were more likely to be cancelled with a cds than regular letters. 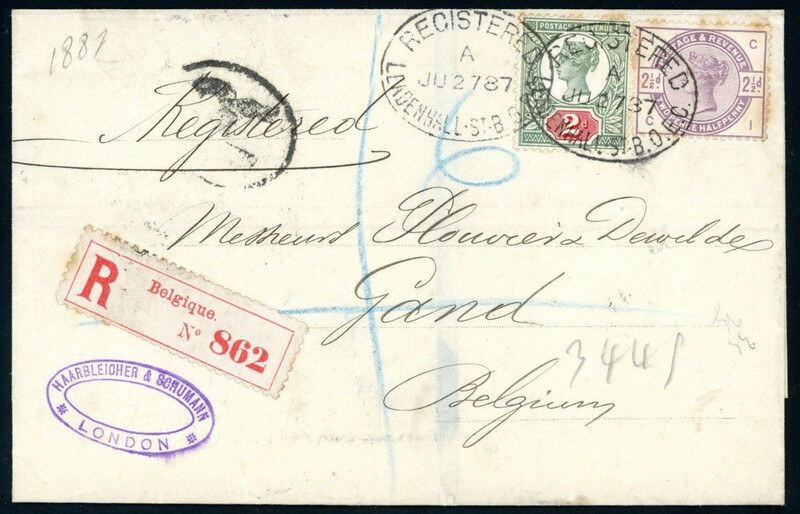 I’m going to eschew the usual “Top 5 Items” for this Ebay report (partly because I’ve not being checking Ebay at all recently) and instead intend to tell a bit of a story about this postcard, concocted by the infamous Reginald Bray and addressed to Shelley Hall using a combination of postmarks and manuscript. 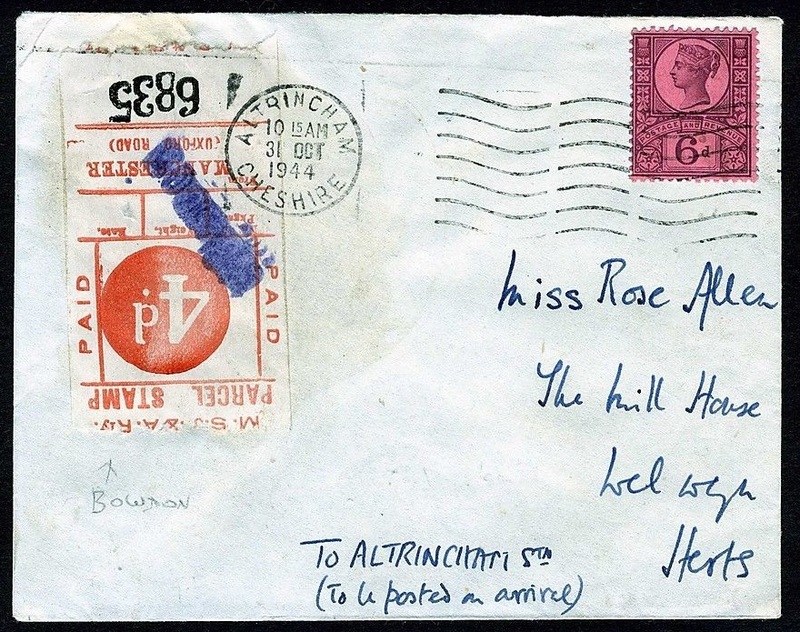 I managed to find out that there is not much left of Shelley Hall, and presumably there wasn’t at the time and Bray was expecting it to be undelivered (the Forest Hill return address is a give away for Bray’s philatelic curiosities). 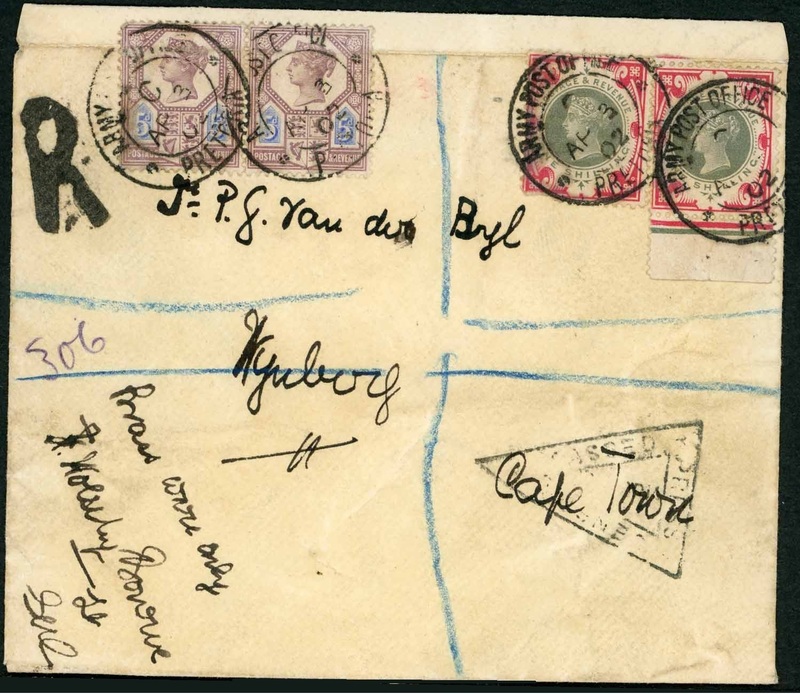 The message on the reverse continues with a mixture of cut-out postmarks and writing: “EY AM” “ANVERS” (I am envious) of you being at Shelley…” (prize of a pair of David Feldman tweezers to whoever can decipher the rest!). Any way, I quite fancied this one so bid £55 and was slightly disappointed that it sold for £58.07. Alas, my disappointment turned to joy when two hours later I received a “Second Chance Offer”! I could buy the item for my top bid of £55. Great! I thought. I was one click away from buying it before I thought to myself. Hang on. Within two hours, the two bidders who beat me were no longer interested in buying an item that they had just bid on (either that or the vendor had an identical one…). Alarm bells rang. So I looked at the two bidders who had bid higher than me (or at least the info eBay will let you see of the bidders). The top bidder bid on 90 lots a total of 277 times in the last 30 days. 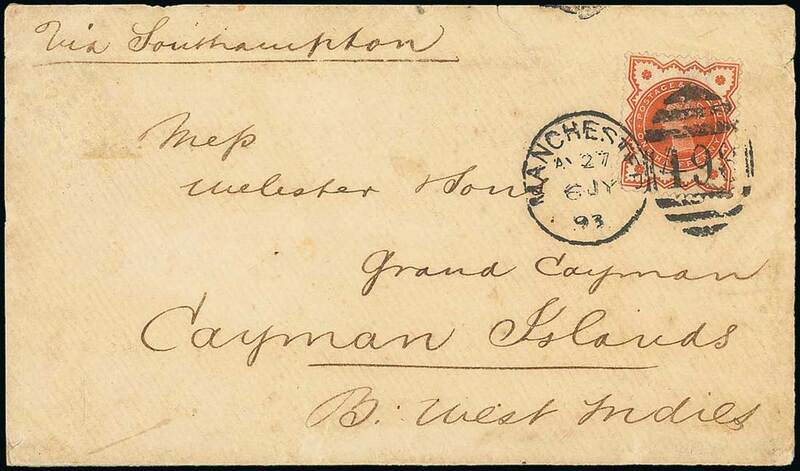 Of these bids, a staggering 53% were on lots owned by the seller of this postcard. And for this lot, in the course of 3 minutes, they increased their bid in stages 16 times from £9 to beyond the final price of £58.07 (we obviously can’t see what their actual top bid was). This screams of shill bidding to me (bidding on an item with the intent to artificially increase its price). So I thought to myself, as the Dragons so eloquently put it on their BBC show, “I’m out”. On a lazy Saturday afternoon I was watching Bargain Hunt when one of the teams picked up a small silver stamp box in the shape of an envelope. It reminded me of the [insert shameless plug here] phenomenal “Primrose” collection of stamp boxes which David Feldman sold in 2000, which in turn reminded me that I had seen stamp boxes in the past with enamel copies of Jubilee stamps on the lid. A quick search of eBay and bingo! This is a Sampson Mordan & Co silver and enamel stamp box, hallmarked London 1891 with a gilt interior and three enamelled stamps: a ½d vermilion, 1d lilac and 2½d purple on blue. It sold for £2670. Anyone looking for more information on stamp boxes are recommended to take a look at this site I just found: http://stampbox.org.uk/. I’ve also found a few different examples with enamel Jubilees so I’ve added a Stamp Boxes page in the Related Info section. 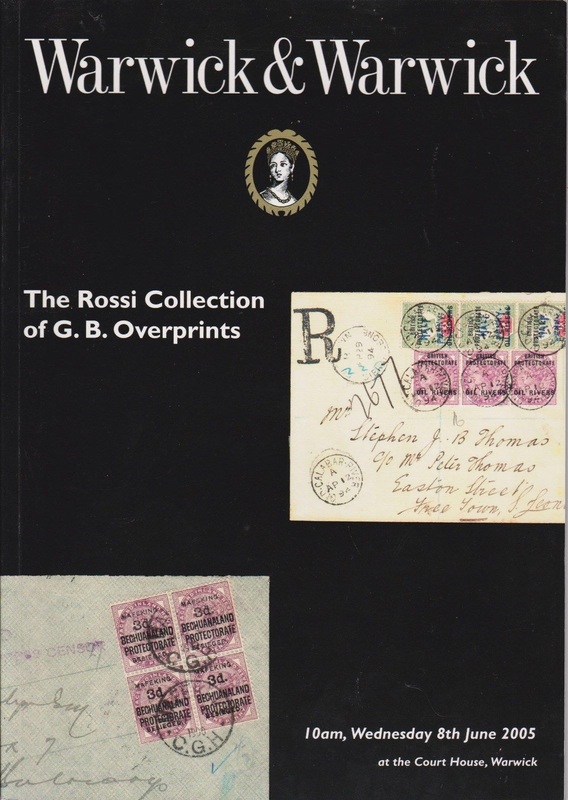 Next we have an important auction catalogue for the collector of overprints on the Jubilee issue. A must have and cheap at only £5.19. 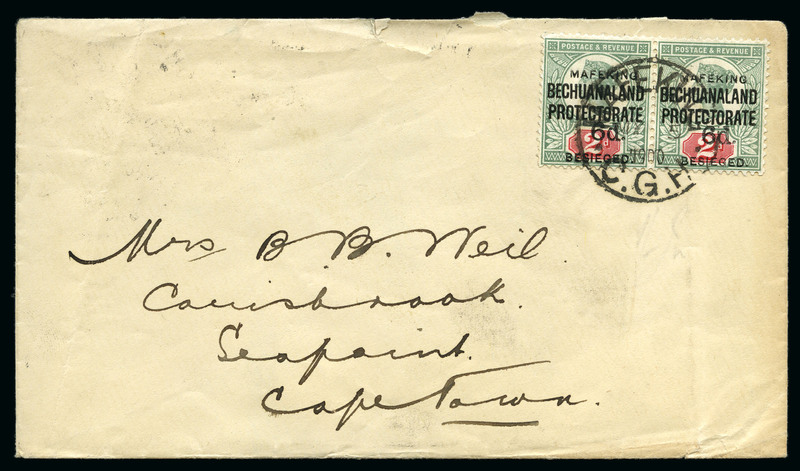 The attractive cover was sent to Northern Nigeria in 1910, with a late usage of the 1887 1/2d vermilion in combination with an Edward VII 1/2d and sold for £16.95. 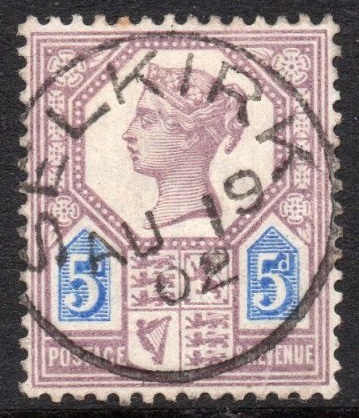 Another combination with Edward VII, but this time it’s a single use of the 4d Jubilee to uprate a 1d + 2d registration envelope to pay double the UPU rate to the USA in 1907. It sold for only £4.10 but I think it’s unusual combination. And finally this was my surprise of the month. 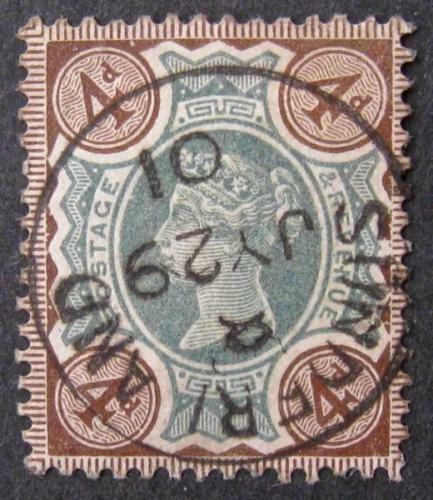 This 9d and 1/2d green paying triple UPU rate and 2d registration sold for £88.75. I’ve seen nicer ones sell for less but I think they are underrated. I should have started this a lot earlier, but I’ve begun a census of known covers bearing the 9d. I’ve only got 30 so far which I will get uploaded some time soon so any one who wants to send me some scans of frankings with the 9d will be greatly appreciated. Been a busy couple of months for me so playing catch up as usual. I’m kicking of this one with one of the most unusual Jubilee items I’ve seen. 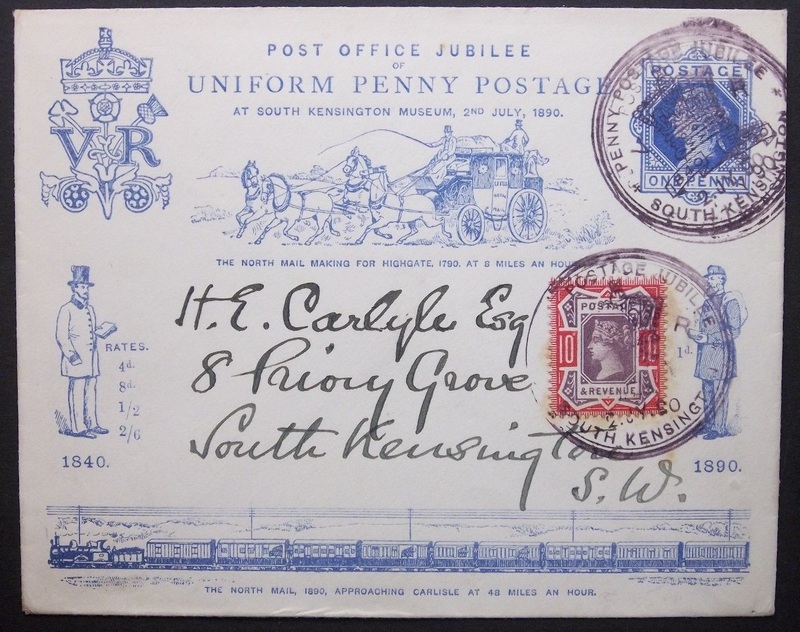 This 6d Jubilee was used in 1944 in conjunction with a 4d Manchester & Altrincham South Junction Railway parcel label, both tied by an Altrincham machine cancel. There was only one bidder at the asking price of £55. Certainly a conversation piece in a collection. 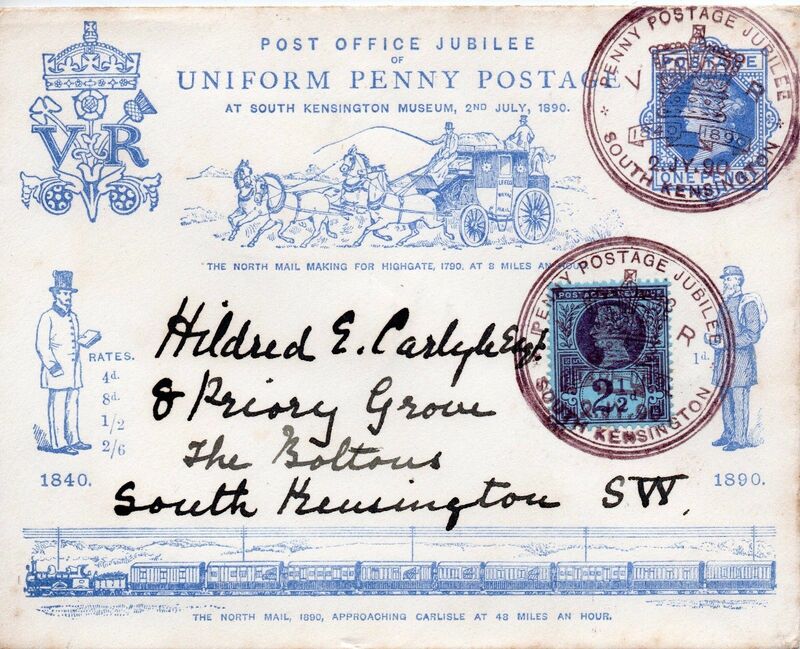 This 1890 Penny Postage Jubilee 1d postal stationery envelope was sent on the first day of South Kensington Museum Exhibition with the special datestamp, over-franked with a 2 1/2d and sent locally. It sold for £110. I may be wrong but I’m always surprised at how much these sell for as they’re not particularly scarce (although they are attractive). But as someone pointed out to me recently, they can “tick the box” of many different collectors (e.g. 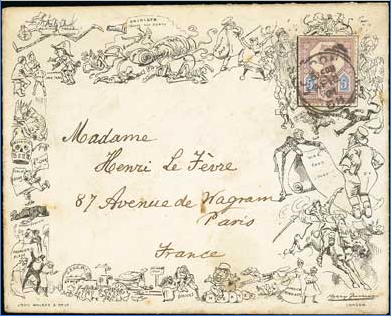 Jubilee issue, Exhibitions, postal stationery, horse thematics and history of stamps thematics to name the most obvious). 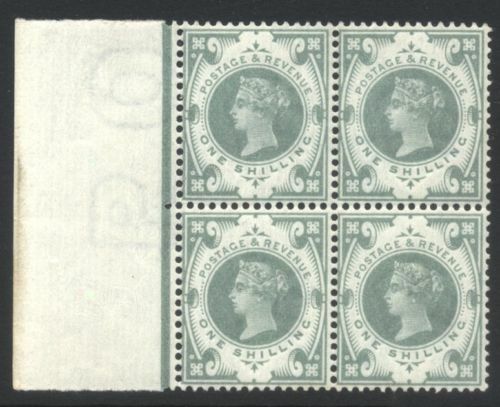 This fresh mint never hinged marginal block of four of the 1s green sold for a solid £741. 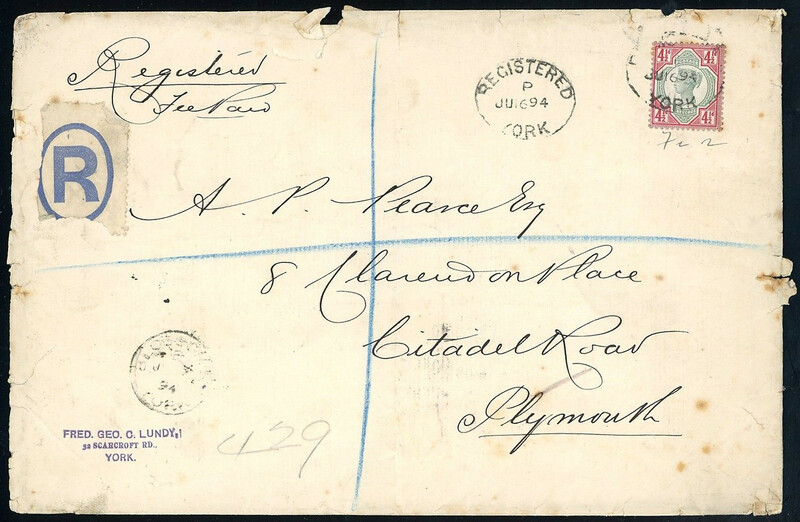 Finally, this cover was sent to a Irish Prisoner of War during the Boer War. 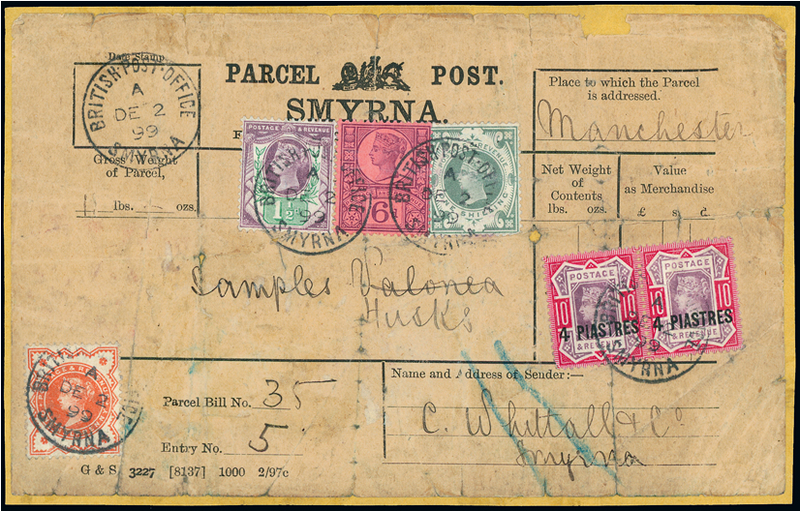 Sent “Care of the Postmaster General” in Pretoria, it was then passed on the the US Consulate in Pretoria and struck with their cachet. 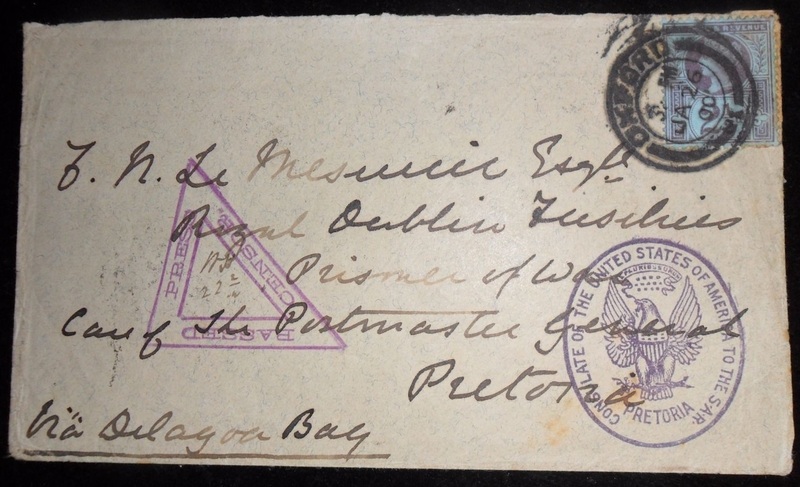 The Consulate acted as the intermediary between the Boers and the British in the exchange of prisoner of war mail. It sold for £117.